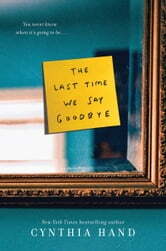 In the tradition of Thirteen Reasons Why and All the Bright Places, The Last Time We Say Goodbye is a deeply affecting novel that will change the way you look at life and death. From New York Times bestselling author Cynthia Hand comes a stunning, heart-wrenching novel of love and loss, which ALA Booklist called "both shatteringly painful and bright with life and hope" in a starred review. Since her brother, Tyler, committed suicide, Lex has been trying to keep her grief locked away, and to forget about what happened that night. But as she starts putting her life, her family, and her friendships back together, Lex is haunted by a secret she hasn't told anyone—a text Tyler sent, that could have changed everything. I had to let this book sit with me for a while after I read it. I was expecting tears, I was expecting to cry. And I did. At the End. The very last chapter got me. I do not ever want to know what it is to survive something like this. To be the ones left to pick up the pieces. This book put a lot of my thoughts into perspective. It gave me new appreciation for the life I have. The ups and downs. I have only ever read books of this nature from the side and thoughts of the committer, never from the other side. This was a new and bold take on it. The book is raw, and hard. It is filled with emotion and anger and people. It is an incredibly cathartic read. At least it was for me. I put this book down and it felt heavy after. My heart felt heavy, for the writer, for the characters, just in general. Thank you so much for writing this book. It will truly stay with me for a good long time. This book was awesome. The ending made me cry and really makes u think about life. We need to remember to live every day as if it were your last.